Many home owners have problems with snakes, and wish to know how to prevent them from using their yard and property as habitat. Any wild animal will live in an area if that area provides suitable food and shelter. Oftentimes, our suburban homes do offer such requirements. Some snakes like to live under shelter such as decks, sheds, or porches. To prevent this from happening, barriers such as steel exclusion barriers, fences, or latticework should be installed. See this exclusion barrier page for examples of snake fencing options. In addition, oftentimes snakes are attracted by the presence of food sources, such as rats. Thus, rat control is an effective means of helping to keep snakes away. Once an animal has established a behavior of visiting your property for these food sources, it can be hard to make them break the habit. Eliminate debris such as wood or rock piles on the property. Cut down heavy brush or trim back hedges. Seal small gaps under doors or decks, etc. Use funnel type traps or glue board type traps along edges. An extreme remedy would be a perimeter wide fence sloping outward at a 30 degree angle. Use of sisal rope around the property - the theory is that the course rope is tough on a snake's belly, but it's not true. 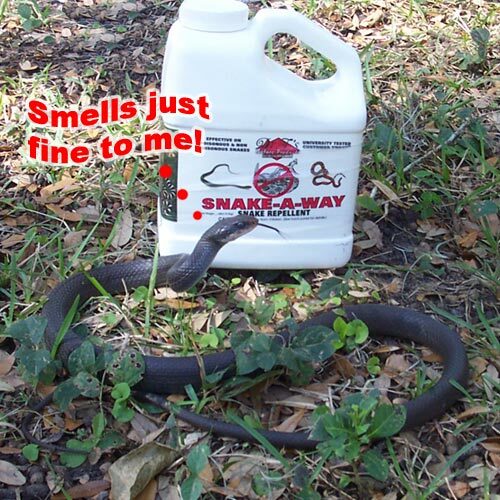 Use of snake repellants such as sulphur, mothballs, or Snake-A-Way, a combination of the two. Use of predator scents such as mongoose urine. Use of ultrasonic sound emitters (snakes can't hear, at least in high frequencies). Use of fake owls or hawk decoys. A lot of people ask me about snake repellent powders, granules, or sprays. After all, they are sold in popular stores like Home Depot, so they've got to work, right? Absolutely not. I, and many herpetologists (snake experts) have tested these products repeatedly. They are just mothball flakes and sulfur! The same cheap stuff that is sold as every kind of generic "critter repellent". Not only are they completely ineffective, they poison the environment. You can read more about snake repellent here. If you have a snake problem that you need to get rid of, the best bet is to actually catch the animals and physically remove them from the area. This is not usually a good field for amateurs, so if you need such services, it might be best to call a professional from the linked list of nationwide pros. What keeps snakes away from you home - What keeps snakes away from your home is proper attention to the details of your yard. Keep in mind that a snake does not want to invade your house like a rodent does. A snake might want to live under your patio rocks, but it doesn?t want to be inside chewing on wires. To get near your home, the snake needs to cross your property. The only way a snake will be comfortable doing this is if the grass of the lawn is long enough to provide ample coverage. This should be your first lesson: Keep your grass short. You will be amazed at how few snakes you see when your lawn in mowed regularly. Any garden on the property need to be small and spaced apart with the short grass between them. Gardens are another way for snakes to get near your home. The thick flowers or ground cover will keep the serpents cool and protected. Many homeowners don?t realize that gardens around the walls of your house can be a lure to many pest animals. It also doesn?t hurt to keep water sources at a minimum. People with in-ground pools tend to see a lot of snakes.